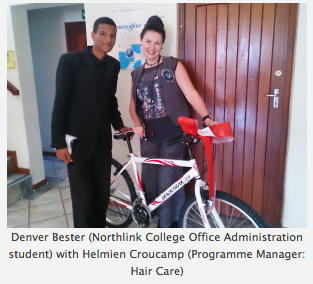 In collaboration with the Northlink Care’s Campaign, Parow Campus’ Hair Care Department’s lecturers and students heard about Denver Bester, a student who studies Office Administration at the campus that faced many challenges daily travelling from Delft situated in the Northern Suburbs of Cape Town to college. It was the result of determined individuals that took initiative to raise funds to assist Denver. Through circulating a raffle they managed to raise just over R1000.00 and bought Denver a brand new bicycle, helmet an additional to help him travel to college. “Thank you to everyone who helped with assisting me, you are now investing in my future, and I THANK YOU,” said Denver Bester upon receiving this generous gift. 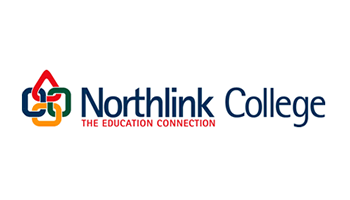 Northlink wish to thank all the participants who made the handover possible and will strive to make a difference in the life of one student at a time across all seven Campus’s.